I just got my second Golden Tote shipment this week and I'm really excited to share it. I loved EVERYTHING! It was so much fun! It took me a few days to get all the photos together, but I'm finally ready to do my big reveal! Golden Tote is a new service for me. I received my first tote in October - you can check that one out here. 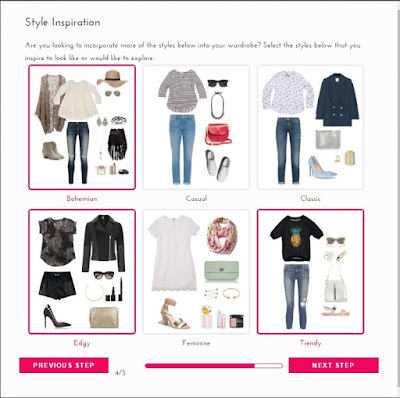 I've got much more experience with Stitch Fix, another clothing-by-mail service. I hesitate to call either of them a "subscription" service, because they are both very flexible. You can order or not order as you wish! All right - back to Golden Tote! As you can see, they show you a few different style types. You can check/uncheck as you wish - it's easy to update if you want to try something different for the next tote. You are also able to specify certain colors and prints that you would like to avoid, which is helpful if you are not a fan of something that is "in". 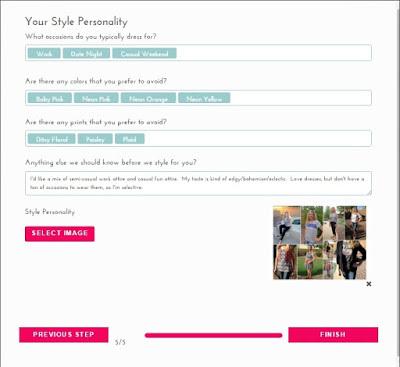 You can also attach an image to further depict your own personal style. From what I understand, most people create collages (as I did). You can order a tote at any time. A lot of people buy multiple totes per month! You can choose a small or large tote. The small tote is $49 and includes 1 item that you choose and another "surprise" item. The large tote is $149 and includes 2 items that you choose and 3 to 4 surprise items. There is also an option to add on additional pieces from their online boutique for a reduced price. The one drawback is that, if you want the bargain prices (around $25 per item), you have to keep it all. You can send the whole thing back for a full refund (though you do have to pay for return shipping). You don't get a prepaid envelope/box. Basically you have to box it up yourself and ship it back with the packing slip. If you just can't part with an item, you can keep it and send back the rest, but you will be charged the full boutique price, which is often quite a bit higher than the $25 average. There is a great Golden Tote trading group on Facebook. I thought it would be a hassle, but I was able to trade most of my unwanted items from last month. I still have one cardigan lying around that I'm trying to sell/trade, but I definitely got my money's worth! Golden Tote has a major launch at the beginning of each month. I have been amazed at the amount of excitement that builds up (in the FB group) when the next launch is due. It's intense. People set their alarms so that they can wake up and be the first to shop when the new items are available. Some of the most popular chosen items sell out quickly! I ordered a large tote with a couple of extra items. Here's what I got! I'm a sucker for polka dots. This is a Collective Concepts top. It's pretty thin, but this is Arizona, so I can still wear it as a winter top! :) I love it. Everything about it. It's definitely a keeper! This top is also made by Collective Concepts. I'm not usually a huge fan of floral prints, but I love the colors in this one! I also thought the asymmetrical hem was interesting - I had to go for it! It's definitely another keeper. The fit is great, and I can wear it to work or for a night out! I will be wearing this one a lot! It's just a bit roomy, but I'm OK with that. I can put it over thicker tops without it being uncomfortable. From the FB group, I have gathered that this item runs big. A lot of people are trying to trade for a size down, but I think mine will be fine! If you read my last review, you saw that I had no luck with my surprise items last month. This month was different. I love this top! I wore it yesterday with skinny jeans and sandals and felt so stylish on my day off! The white fabric is super stretchy and a bit sheer. If I wore this to school, I'd probably wear a white camisole underneath, but yesterday I didn't care. :) I love the colors and pattern - a perfect casual boho top! I was sad that these pants didn't fit quite right. I think they're cute! As you can see, they are VERY short! I'm trying to get behind the whole ankle pants thing, but these are just beyond my comfort level. They'd have to be an inch or two longer. Here's a shot that shows the print a bit better (more light). These pants are a medium. That usually works for me, but I think these run small. They were super tight. I was able to try them on for the photos, but they were not comfortable. They would work much better on a slightly smaller, shorter person. Fortunately, I was already able to sell them through the GT trading group! They are in the mail and on their way to their new home! Too bad . . . they are totally my style! I love this dress! It's a beautiful blue color with a light yellow geometric pattern. The material is soft and stretchy. Unfortunately, it doesn't love me - at least not to the same degree! Ha ha. I have a long torso, and the waistline is just high enough to bug me. Also, it's a bit snug on the top. It looks OK from the front and side, but there are some bulges in the back. :/ I'm tempted to go on a juice fast so I can lose 6 or 7 pounds and wear this dress, but life is too short for that, you know? There will be other dresses! I've already posted this to the FB group, and I've had some interest. I'm pretty sure I'll be able to sell or trade it! My last surprise item was this top. Sometimes I get burned out on plain black items, but they are so versatile! Also, I usually wear black to our concerts at school, so it's nice to have another dressy top that will work for those occasions. I wasn't sure about the bow at first. Is it supposed to be tied above the v-neck? It's only attached at the shoulders, so it can be tied loose or tight. I decided to leave it loose so it blends into the neckline. I've already worn this to work. I love the sheer sleeves! About a week after I bought my tote (but before it had shipped), I bought this hat from the boutique. I'm trying to be a bona-fide hat person! They just threw it in with my other items, so I didn't have to pay shipping! The hat was $36. I really like it and I'm going to make an effort to wear it! I still have to remind myself that wearing hats is a thing, but I'm much better about it than I used to be! So, that's that! I was thrilled with this tote, even though two of the items didn't fit quite right. Everything was my style! My tote was styled by AC, and I thought she did a great job! I still love Stitch Fix, but I have found that Golden Tote is just as much fun, but in a slightly different way! Per item, it is definitely cheaper. 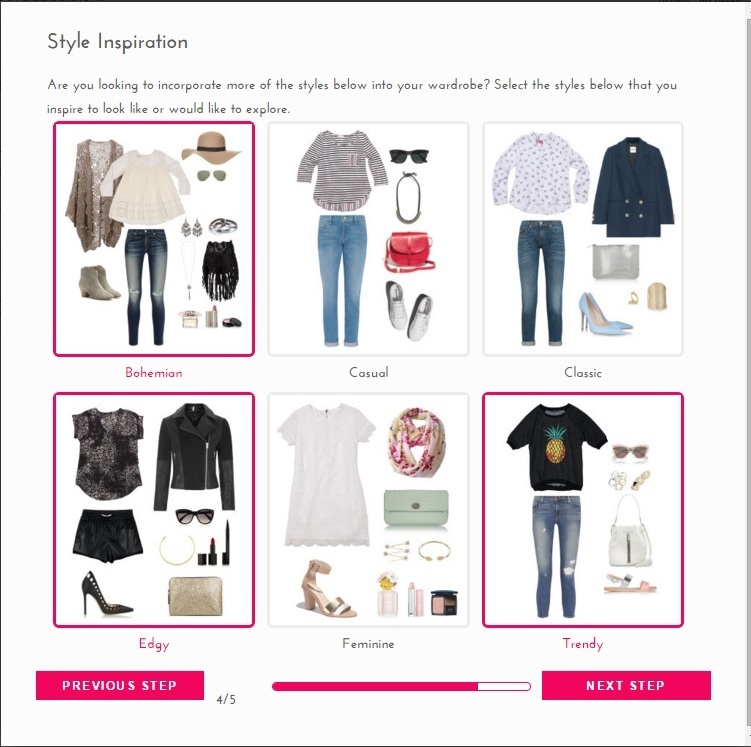 However, Stitch Fix feels a bit more personalized. I'm having fun with both services. In fact, I'm almost getting to the point of having TOO MANY cute things in my closet! O.O I'm going to have to start changing clothes at lunchtime to make sure everything gets into the rotation. Ha ha. Please comment? What do you think about the items I received? Have you received any of these items? What did you think? 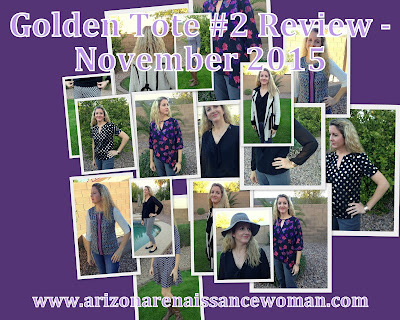 Which do you prefer - Golden Tote or Stitch Fix? Thanks again for reading!